The Three Holy Hierarchs of Eastern Christianity refers to St. 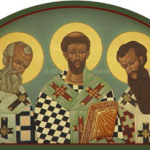 Basil the Great, St. Gregory the Theologian and St. John Chrysostom. They were highly influential bishops of the early church who played pivotal roles in shaping Christian theology. In Eastern Christianity they are also known as the Three Great Hierarchs and Ecumenical Teachers, while in Roman Catholicism the three are honored as Doctors of the Church. The three are venerated as saints.